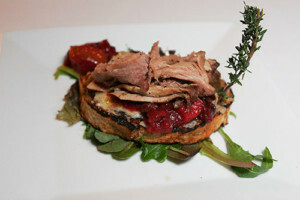 Duck Confit Bruschetta at Snowvillage Inn. 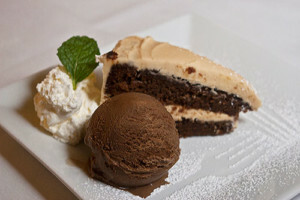 Gingerbread with salted-caramel vodka frosting, served with espresso ice cream at Snowvillage Inn. 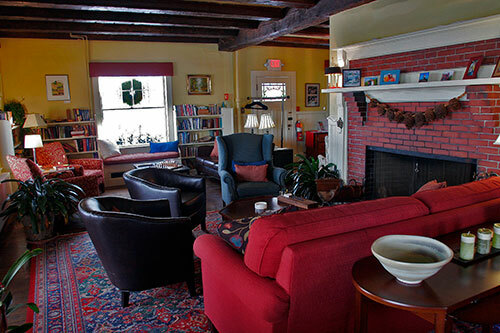 The first floor lounge at Snowvillage Inn, Eaton. 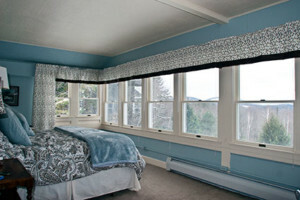 The Frost room at Snowvillage Inn in Eaton. 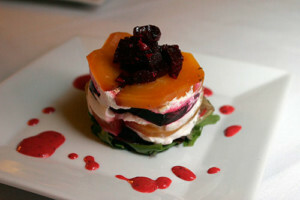 Three Beet salad at Snowvillage Inn. Three game plate of wild boar and venison sausages and breast of duck at Snowvillage Inn. The Palmer House Pub was already busy when we arrived at Inn at Crystal Lake for an early dinner. We chose a table in the quieter dining room, where we ordered from the pub menu. The boneless short ribs braised in red wine and rosemary were the most delicious I’ve ever tasted — lean, meaty, juicy and bursting with flavor. The chicken pot pie was filled with chunks of white meat and fresh vegetables in light gravy, topped by flaky puff pastry. My starter salad of mixed greens, vegetables and fresh fruit was so big that we shared it. This was one of the Fridays when Stone Mountain Arts Center, 15 minutes away, was holding a Barn Burner in the two-century-old Quisisana Barn. These casual cabaret-style showcases for less-known performers reflect the center’s usual concert mix of everything from soul to blues to jug band to Zydeco (on June 14 Zydeco master Terrance Simien is scheduled for a concert). We were glad we’d left the blinds open on the dozen windows that fill one whole wall of the Frost Room at Snowvillage Inn because we awoke facing a panorama of the White Mountains that took our breath away. The sky was blue, the day was glorious and we could barely wait to be outdoors enjoying it. But not before breakfast. Innkeeper Jen brought me a big pot of tea steeped from loose leaves and described the day’s choices, from which we selected over-easy eggs cooked into a heart-shaped cut-out in the center of whole wheat toast and French toast served with NH maple syrup. While we waited for these to be cooked, we munched on whisper-light banana nut muffins fresh from the oven. Right after breakfast, we put our kayaks into Crystal Lake in the center of tiny Eaton. 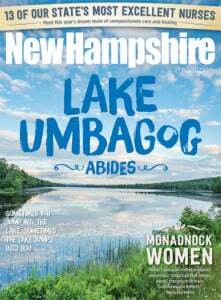 One of four Crystal lakes in New Hampshire (a testament to the clarity of our waters), this one has a picture-perfect setting surrounded by hardwood trees. The leafy shore is highlighted by the Little White Church, built in 1879, and now Eaton’s non-denominational Community Church. From our put-in at the town beach, we could walk to Eaton Village Store, a community enterprise that evolved when this long-time town gathering spot was closing. Its success story was evident by the filled seats at the lunch counter, but two accommodating locals lingering over coffee kindly offered their spots and we ordered the daily special — American chop suey — and a BLT. Had we anticipated the size of the serving, we’d have split the chop suey, but we’d been paddling long past noon, so managed to finish both. We couldn’t resist the sign in front of neighboring Motomo Gallery: Chocolate Drive-Through. Turns out that drivers in a hurry can just pull up and honk for chocolate. We recommend going inside, however, for the free samples and to browse in the gallery of paintings, photographs and prints, and to admire a carefully chosen collection of crafts that include hand-dyed and hand-spun yarns, hand-carved decoys, turned wood bowls and original jewelry. After sampling the chocolates, it seemed ungrateful not to leave with a bag of raspberry-filled chocolates and a couple of chocolate-chip cookies. Jen at Snowvillage Inn had told us of a short hike to an overview called Rock Edge, on a trail that leaves the road opposite the church, so we worked off the cookies and enjoyed the view. We stopped for a swim at the town beach, where our room keys allowed us access, and dried off in the sun before heading back. We couldn’t resist a detour to see Frog Rock. This natural effigy is beside the road, a couple of miles short of the Maine border. In the tiny village of Snowville we stopped at Snow Brook Creations, a studio gallery where we admired Candace Maher’s pencil and watercolor work. 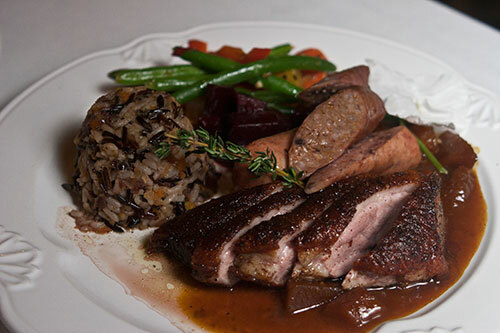 We had sampled the culinary skills of Chef Brian Anderson when he was in Rangeley, Maine, so we knew that dinner would be a full evening’s activity. After a stroll through the inn’s beautiful perennial gardens, at their height in June, and one of innkeeper Kevin’s well-mixed cocktails, we studied the menu. Descriptions were so tempting that we abandoned our usual restraint and ordered four courses, beginning with duck confit bruschetta with cranberry chutney and goat cheese, and “lamb lollypops" — Frenched chops grilled rare, sauced with compote of fruit in Indian spices. The beet salad was “stunningly beautiful,” as the maître d' described it. Layers of large, thick-sliced beet rounds alternating red and golden, separated by layers of goat cheese, stood on bed of baby greens in a poppyseed-raspberry dressing. Cinnamon-chipotle pork shank was pan-seared, then slow-roasted in apple cider, and the three-game plate included duck breast, venison and wild boar sausages with mango sauce. Please don’t ask how we found room for slices of four-tier lemon cake with house-made lemon curd filling and lemon zest frosting, and gingerbread with salted-caramel vodka frosting, served with espresso ice cream. After breakfasting on poached eggs on a bed of avocados, we set out for a hike to the summit of Foss Mountain, following the unpaved road uphill from the inn. We could have driven to the trailhead and shortened the climb to 20 minutes, but we were in no hurry. The view from the summit is even wider than the one from our room, circling 360 degrees to show the Presidential Range, Mt. Chocorua, Silver and Conway lakes and the ski rails of King Pine. On the way back to the inn we stopped to visit the alpacas and admire the hand-spun wool at Foss Mountain Farm.